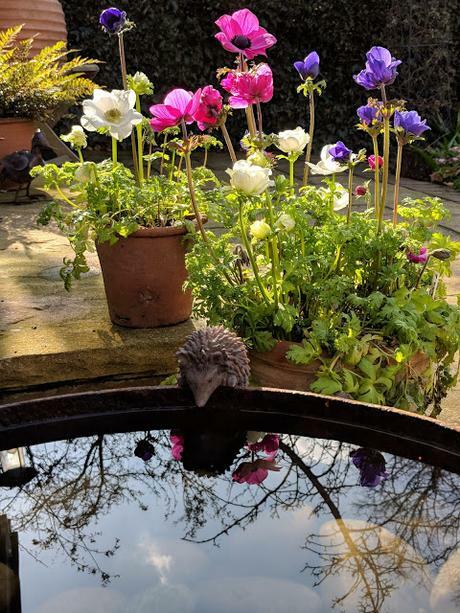 It would appear spring has now finally arrived here in the UK, so I thought it time for a tour of the spring highlights in my garden this weekend. Which also gives me the opportunity to join in for the first time with Six On Saturday, pop over to The Propagator to find out more about this fun gardening blog along. These Anemones have been providing color and structure to the patio area of the garden. These corms where a purchase from Sarah Raven last year and were planted early summer so it's the first spring we have had chance to really appreciate them. Appreciate them we do! 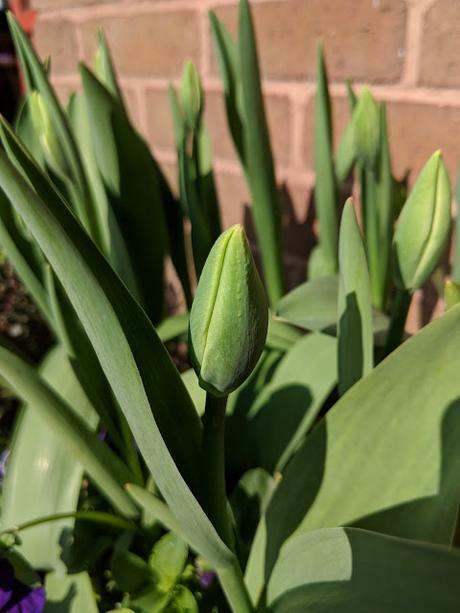 No smirking please, but this year is the first time I've grown Tulips and it won't be long before these will be in bloom, and that you see is a problem. Why? Well shortly I will be surrounded by stunning displays of Tulips as this month I am rather excited to be visiting Keukenhof Gardens in Holland! So if the dozen or so Tulips in my garden could just hold back on flowering until I return from holiday in a week or two's time I would be most pleased. 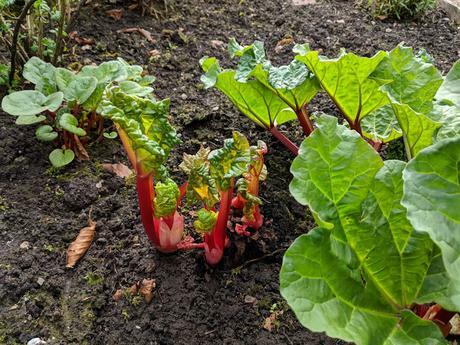 Rhubarb, rhubarb, rhubarb. 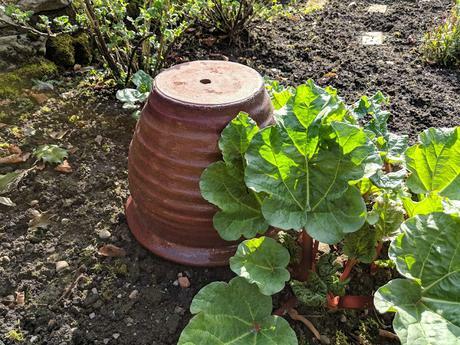 Another first, this year a pot has been upturned and placed on top of one of the rhubarb crowns, and here is a sneak peek on how it is looking. Not long before it's Rhubarb everything in the kitchen. I have been pretty late at getting my seeds sown this year, so there is always the thrill when you spot your first seedling sprouting. 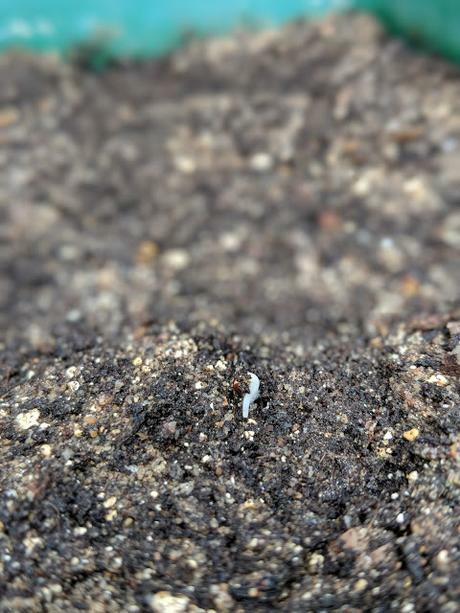 This is the first of my Kale sowings, something I love to sow, grow and eat. I share the garden with my sister, she loves doing all the heavy jobs (honest) as I'm not able to due to my scoliosis. 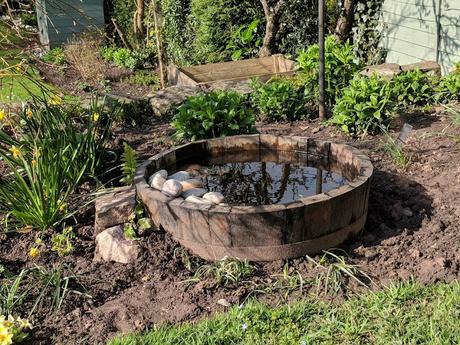 Inspired by an episode of Gardeners World last year, 'we' are putting in a wildlife pond (barrel)- it's a work in progress. We have yet to buy the water lily and other pond plants, which we are hoping to find at the Malvern Spring Show next month. Did you have any loses in your garden this year? This Erysimum Bowles's Mauve sadly has not made it. 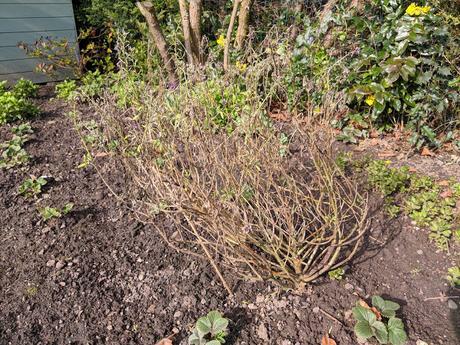 Now this is not unusual for these plants, they usually last a few years then die and as such every year I take several cutting so always have new plants in reserve ready to fill a spot. They give great color to the garden throughout most of the year. Well that's the end of this brief garden catch up, and my six highlights for the month of April. Thank you for taking a tour around my garden with me.